Travel time is often represented using an isochrone map. On an isochrone map lines can be drawn to connect points to show areas which can be reached from one starting point in an equal travel time. A printed isochrone map is normally restricted to visualizing the travel times from one specific location. 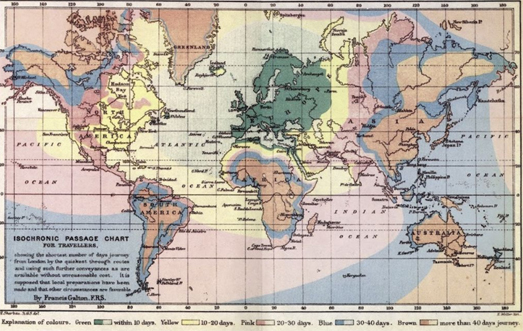 For example Francis Galton's Iscochronic Passage Chart, the first known isochrone map, shows the travel times from London to different parts of the world. The map visualizes how many days it would take to travel from London to different locations across the globe in 1881. Interactive isochrone maps have the advantage of being able to show travel time layers for more than one location. They can allow users to point to a location on the map and redraw the isochrone lines on the fly. For example TravelTime allows you to click on a map to view the travel times from the selected location. Therefore, unlike printed isochrone maps, interactive isochrone maps can show travel times from more than one starting point. Interactive travel time maps are however still restricted in that they can only really show one or two isochrone layers at any one time. Once you start adding more than a few starting points to a map the overlapping ischrone layers become hard to read. If you want to show travel times from more than one location at the same time and on the same map then you might want to use a travel time cartogram. On Time Everytime is an interesting interactive map that attempts to show the travel time between every Dutch station at the same time. It does this by moving stations closer or further away from each other on the map based on the travel time between each station. It therefore takes the approach of a cartogram in visualizing travel times, distorting geographical distance based on the time it takes to travel between locations. The On Time Everytime interactive map visualizes the movement of all trains on the Dutch railway network over the course of one day - December 14th 2018. It therefore shows the travel times between the different stations at all times over the course of a single day. Because some trains are faster than others the travel times between individual stations constantly changes depending on the speed of the train traveling between the two stations. On Time Everytime overcomes this problem by moving the locations of the stations closer together or further apart on the fly depending on the current train's journey time. It therefore takes an interactive cartogram approach to visualizing travel time, distorting the geography of the map on the fly based on the speed of the trains currently shown on the map. Nate Parrott has also created an interactive travel time cartogram to show how long it takes to travel between stations on a public transit network. If you click on a station on his NYC Subway Travel Time map then the New York subway map automatically redraws itself so that the distance to all stations represents the journey time from your selected station. Users of the map are already familiar with the concept that transit maps distort geography and are not strictly geographically accurate. Therefore this interactive travel time cartogram works really well as a visualization of journey times as it doesn't suffer unduly from the usual problems of illegibility common to many time cartograms. Users are also familiar with the use of colored lines to show the transit system's different lines. If you are already familiar with a line and its stations on the New York subway map then you will still be able to pick it out on a distorted time cartogram based on the line's color. Even if you are confused by the NYC Subway Travel Time map you can still mouse-over a station on the map and quickly reorient yourself based on station names.